The earliest connection to the Geneva Tool Co. indicates that a man named Norman S. Caswell, a maker of scythes, handles and related items sold his goods from the back of his wagon as early as 1849. In 1854 he formed a partnership with O. H. and J. H. Price and then worked in a building located on the south ridge of Geneva, Ohio. By 1868 the company was doing well enough to justify the forming of a stock company, which was then named the Geneva Tool Co. In addition to manufacturing some of their goods, the company may have applied labels and/or markings to the goods they resold that had actually been obtained from other sources. Axes bearing the Geneva Tool Co. name seem to have been advertised more in Canadian catalogs than catalogs from US concerns. Axes with the company name appeared in the 1901 Caverhill, Learmont & Co. catalog as well as magazine advertisements for Caverhill, Learmont & Co. during the first two decades of the twentieth century. Caverhill, Learmont & Co. was a Canadian company located in Montreal, Quebec. 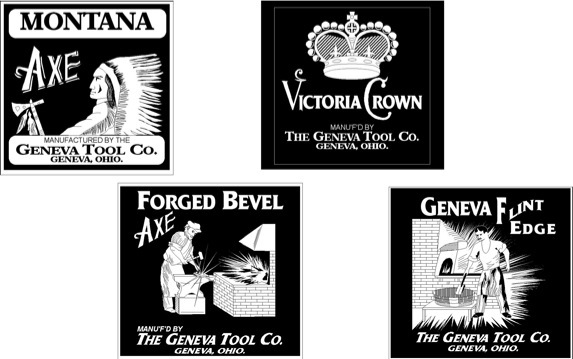 The Geneva Tool Co. was one of the sixteen companies that joined together to form the American Fork & Hoe Co. in 1902. Many of the brands owned by those sixteen companies continued to be made and distributed. When the American Fork & Hoe Company bought the Kelly Axe & Tool Co. and changed the division name to the The Kelly Axe & Tool Works the Geneva axe brands may have been replaced by the brands associated with the Kelly Axe & Tool Works. That division of American Fork & Hoe Co. later became True Temper. The line of brands and their labels may have been continued to satisfy marketing arrangements involving distributors in Canada but they replace in the states with the brands associated with the American Axe & Tool Works. Etched marking used on some axes made by the Geneva Tool Co. 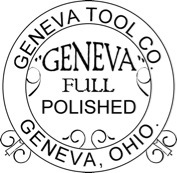 It is believed that when the Geneva Tool Co. became part of the American Fork & Hoe Co. they were also making or added shovels, spades and scoops to their product line. Like many products, manufacturers used their own brands on goods sold through wholesalers. 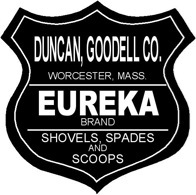 Eureka was one of the three brands of shovels known to have been made at the Geneva plant. The other two were Geneva and Oxford. Facsimiles of axe labels depicted in catalog No. 40, dated 1901, from Caverhill, Learmont & Co., a Canadian wholesale hardware concern. Comments, feedback and additional input are always welcome. Additional information or suggested corrections should be accompanied by verifiable sources or copies of same. Click on one of the other topics in the menu box at the top to go to a different department or article. Caverhill, Learmont & Co. catalog No. 40, Montreal, Canada, 1901. The labels and markings were observed in the field, in catalogs and advertisements and/or redrawn based on those observations. All the graphics have all been drawn by the author.